The apostrophe is one of those pieces of punctuation that get a lot of people in trouble. It looks like a comma that hangs in the air rather than on the line and causes writers no end of confusion. It shows the omission of some letters in a word. It shows plurality of single letters, single numbers, and acronyms. Today, we’ll go over the basics of the first rule: creating possessive nouns. We humans love to collect things (just ask George Carlin). We pick stuff up wherever we go, and we want the world to know what belongs to us — especially when we write about it. Possessive nouns and pronouns show that ownership. Positioned correctly, that hanging comma — the apostrophe — shows you who owns what. So far, so good. Now let’s look at singular nouns. And if you’re following a completely different style guide, your best bet is to look up its rule. Writers often get confused with its. If you see it’s, you’re dealing with a contraction: it is. If you see its, you’re dealing with a possessive pronoun. As you start to pay attention to the apostrophe, you’ll see other situations that make you pause: compound words, joint possession, quasi-possessives, and more. I’ll cover these rules (and the other two uses) in a separate post. Until then, if you have a specific example you’d like help with, send it to me and I’ll help you out. This entry was posted in Punctuation Points and tagged apostrophe, possessive nouns, Punctuation Points, punctuation rules. Bookmark the permalink. Nice summary. The exceptions for proper nouns that end in S, Z, or X (Texas? ), classical or Biblical names (so most Greek thinkers take only an apostrophe? ), and sibilants (how are they even sibilants if written?) tend to undercut the basic rules. No wonder that even advanced students of English struggle with the rules. It’s lovely to have a firm house style, but what happens when you move? I conclude that we’ll never have an accepted set of rules for pluralizing singular nouns. I also conclude that some of AP’s bizarre rules have an inordinate and negative impact simply because they show up in many big-city papers. 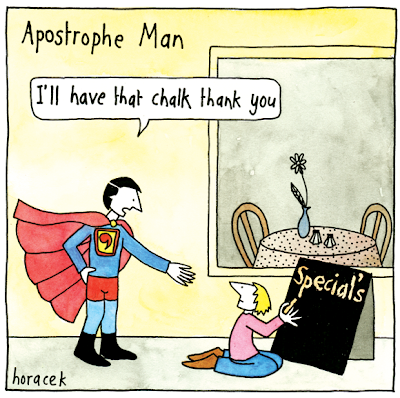 The irony of the above cartoon is, like many grammar tyrants, Apostrophe Man is making punctuation errors while trying to correct a punctuation error (known as McKean’s Law after Erin McKean, now of Boston.com). Michael, you are the first person to comment on that error! I noticed it but decided to use the cartoon anyway. Erin McKean is so right, and the law underlines how hard it is to remove all errors.